Dizzy Gillespie: 'The Complete RCA Victor Recordings' "A Night in Tunisia" is frequently called Dizzy Gillespie's greatest composition. The Complete RCA Victor Recordings has two versions of it, as well as titles such as "Hey Pete! Let's Eat More Meat" that capture the playful humor of Dizzy Gillespie's Big Band. The album tracks Gillespie's development from 1937-1949, when he rose from an experimental soloist to a jazz legend. MURRAY HORWITZ, American Film Institute: That's one of the most fully orchestral sounds you'll ever hear in jazz music. It's the Dizzy Gillespie Big Band from the late '40s. And A.B. Spellman, you say it should be part of our NPR Basic Jazz Record Library. A.B. SPELLMAN, National Endowment for the Arts: Absolutely. Primarily, I say this for the big band, but that's not all that's on here. You have some very early Dizzy, when he's playing with the Teddy Hill Orchestra or with the Lionel Hampton Orchestra. You have some small group stuff from the 52nd Street time, when he was playing all the clubs there. And you also have a very interesting couple of tunes from the Metronome All-Stars, which put him with a wide array of jazz talents of the period. But, mainly you've got Dizzy Gillespie's Big Band here working, and that's a band that is very important for everybody to know about. For one thing, it swung like bands did at that time — hard. Its rhythmic sense was powerful. It's, I call "attack phrasing," because they hit every note like they were fighting it. And it's also got a lot of the humor. These guys liked to tell jokes with their music. HORWITZ: Well, just some of the titles tell you: "Hey Pete! Let's Eat More Meat," and "In The Land of Oo-Bla-Dee." SPELLMAN: Let's talk about "In The Land of Oo-Bla-Dee." HORWITZ: It's a Mary Lou Williams tune. SPELLMAN: Mary Lou Williams wrote this with Milt Orent, and it's a very funny and very slick kind of a tune, which has an odd kind of humor that's up in the da-da world somewhere. HORWITZ: It's the hippest, sort of fairy tale you'll ever here. HORWITZ: You mentioned that on these discs we've got Dizzy Gillespie from 1937 to 1949, a very crucial period. Can you really hear his development as a trumpet player? SPELLMAN: Most certainly. In 1937, you catch him playing with the Teddy Hill Orchestra, and he is not fully developed yet. He hasn't gotten his range developed, he's trying to play notes that he can't yet hit. He also hasn't gotten the whole concept of bebop improvisation down yet. HORWITZ: Nor the style. He said that once he met Charlie Parker, that showed him the style. SPELLMAN: Oh yeah, but they're still working on basic structure of chord change improvisations that was to characterize bebop as well. All this stuff is not worked out yet, so this is not a fully developed soloist, but it's a very good young soloist. This is a real prodigy that you can hear. SPELLMAN: You can hear this music develop in this band as well, and some fabulous soloists came through here. HORWITZ: John Coltrane was in this band, right? SPELLMAN: John Coltrane is here. SPELLMAN: Jimmy Heath. You have Milt Jackson, Kenny Clarke, John Lewis. HORWITZ: And, of course, no Dizzy Gillespie anthology would be complete without his greatest composition, "A Night In Tunisia." SPELLMAN: And here, we have two versions of that, and it's interesting to compare them. HORWITZ: So, there's much to recommend for your National Public Radio Basic Jazz Record Library. 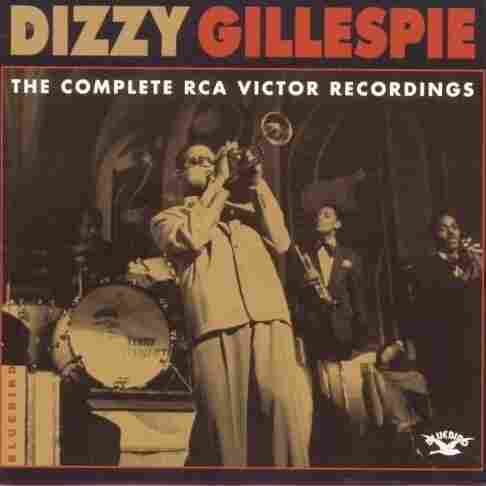 Dizzy Gillespie, The Complete RCA Victor Recordings, a two-CD set on the RCA/Bluebird label. For NPRJazz, I'm Murray Horwitz. SPELLMAN: And, I'm A.B. Spellman.